Two brass lamps with painted tole lampshades. 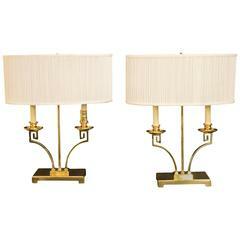 Pair of brass table lamps. Measurements without the lampshade: 22 H" x 12" W x 6" D.
Pair of red brass table lamps. Measurement with the shade is 13"D.
Dynamic pair of table lamps. Pair of 1970s Lucite table lamps. Pair of Lucite lamps with thick stepped vertical slabs of Lucite. Mounted on thick Lucite bases. 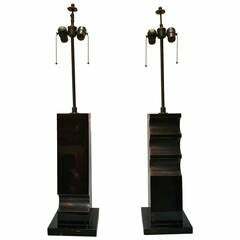 A pair of tole lamps, originating in France, circa 1830. 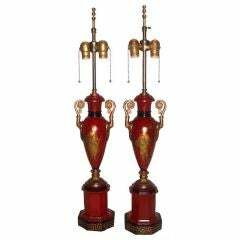 A pair of Italian made gilt brass bouillotte lamps with black tole shades. Each lamp with two lights with swan motif handles. Made in Italy. Contact us for a UPS Shipping quote! A whimsical pair of handmade vintage tole decorated carved wood pineapples vibrantly painted and dramatic in form. An old Palm Beach find. 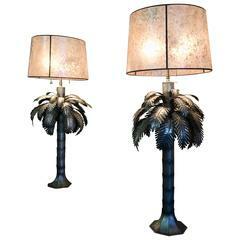 Pair of silver tole palm tree table lamps. Probably from the 1970s. Maker unknown. Columnar form with neoclassic gilt decoration on a square plinth base. Very fine pair of Charles X period urn form red tole lamps with gold hand-painted and black detailed, male and female roman figures on hexagonal bases with Greek key trim. 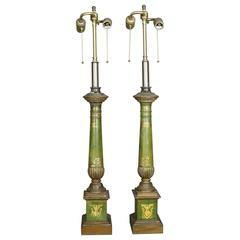 Pair of 1940s French painted tole lamps with brass details. Measurements: 23" height of body.